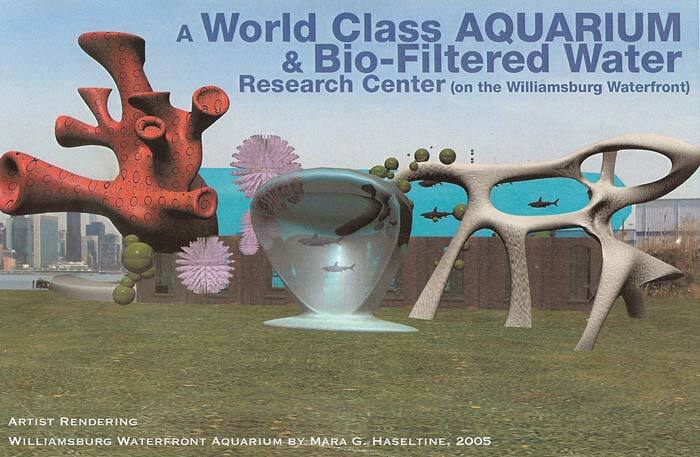 What is the Bio-Filtered Brooklyn Aquarium (2005)? A world-class aquarium on the East River focusing on fabulous fish and innovative water filtration systems. Featuring a 60' HIGH, 3 BLOCK LONG Pelagic FISH TANK VISIBLE FROM MANHATTAN and FILLED WITH FILTERED East River water! A focal point for those committed to finding working solutions to the problem of world-wide water pollution, drawing specialists from the international community for research and development in all areas concerning the properties of water. The waterfront development should be about the water. The Aquarium would be an educational resource for New York and a living laboratory for researching solutions to water pollution. NYC will gain a reputation as an innovator in environmentally sound water filtration technology. A shining clear tank with fish living in East River water will stand as a monument to NYC's committment to the environment. A commercial district with stores and restaurants would grow around the Aquarium, bring much needed jobs with displacing our current factories. The average Aquarium in the US receives 1 to 2 million visitors a year. Because of its environmentally friendly nature, beautiful design, and INCREDIBLE LOCATION, we expect twice as many visitors to our Aquarium per year.